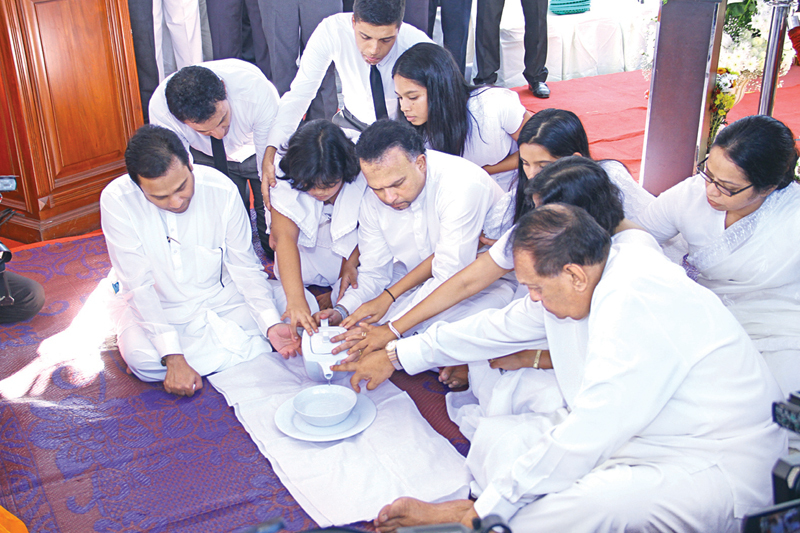 The funeral of Srima Dissanayake, wife of former Minister Gamini Dissanayake was held at the General Cemetery, Kanatte amidst a large gathering of people of all walks of life, including Speaker Karu Jayasuriya, Prime Minister Ranil Wickremesinghe and Parliamentarians. Crowds kept streaming into her residence at Wijerama where the remains lay since Friday to get a final glimpse of Srima Dissanayake who was the force behind the Gamini Dissanayake Institute of Technology and Vocational Studies. Many of them wept reminiscing the past while religious leaders, leading lights of various professions and other fields including President Maithripala Sirisena, Ministers, members of the Diplomatic Corp were present in large numbers. Funeral proceedings commenced with the Panchaseelaya being administered by the Anunayake of Malwatte Chapter Most Ven. Niyangoda Vijithasiri Thera. Mahanayake of Kotte Sri Kalyani Samagri Dhamma Maha Sangha Sabha Most Ven.Ittepane Dhammalankara Thera and Mahanayake of Amarapura Nikaya Most Ven.Kotugoda Dhammawasa Thera, delivered Anusana describing how late Srima Dissanayake was committed to the service of the public. President Maithripala Sirisena’s message was read out by Minister Gamini Jayawickreme Perera. Prime Minister Ranil Wickremesinghe, speaking on behalf of the government said the late Srima Dissanayake was a strength to her husband, late Opposition Leader and Minister Gamini Dissanayke . “Mrs. Dissanayake shared victory, sorrow and defeat with Gamini Dissanayake,” the Prime Minister said. He also lauded her uninstinted courage for deciding to vie for the Presidential Election in 1994, after the assassination of her husband, who was the then Presidential Candidate. “Winning that election at that time was not an easy task,” he added. Prime Minister Wickremesinghe also reminded and appreciated Srima Dissanayake for the wholehearted support extended by her for the success of the Mahaweli project. Speaker Karu Jayasuriya said late Srima Dissanayake was dedicated to serve the less privildeged. “She had a very close association with people from all communities and was a humble and brave lady,” he said. Stating that she came forward to fill the void created with the assassination of her husband, late Gamini Dissanayake, Speaker Jayasuriya said that she took that decision on behalf of the country and the party. “Late Gamini Dissanayake was able to render a historical service to this county as he was backed all the way by Srima Dissanayake,” the Speaker pointed out. Speaker Jayasuriya also said although the Dissanayake family lost their properties due to the Mahaweli scheme, she was happy as many people could benefit from that vast project. “She also dedicated very much to make the dream of the Mahaweli Seya of Gamini Dissanayake a reality. Finally, she achieved it with the support of Minister Navin Dissanayke,” he added. Jayasuriya appreciated the establishment of the Gamini Dissanayake Vocational and Technical Training Institute by her as it provides an admirable service to the students in the area today. Minister Navin Dissanayake, the elder son of Srima Dissayanke while thanking all those who shared their grief with the loss of his mother, invited all UNP members to get together at the upcoming Presidential election to elect a UNP President after 25 years. “We are ready to stand on behalf of women and to protect their rights as it was the wish of our mother,” he added. “We are to make the dream of my parents of a prosperous Sri Lanka, a reality,” he added. Former President Chandrika Bandaranaike Kumaratunge, politicians and members of the Dissanayake family were present.